J.C Newman Cigar Co. Chairman Stanford Newman first approached his good friend Carlos Fuente Sr. about an idea he had in 1985. Stanford wanted to make the first affordable "Premium" cigar. At the time, La Unica was sold in bundles - an unheard-of packaging style for a "good" cigar. Even though the only cigars sold in bundles up until that time were "factory seconds", Stanford believed that cigar smokers would appreciate the value offered by a great Premium Cigar packed in a bundle, instead of boxes - if and only if Carlos and Stanford could come up with just the right cigar. Together they met the challenge - Carlos selected the shapes, Stanford approved the blend, and in 1986 La Unica Dominican Primeros were born. Using the finest Connecticut wrappers, aged Dominican fillers and binders, it is no surprise that La Unica immediately became a hit. La Unica is a well balanced rich tasting Dominican handmade cigar, skillfully crafted in the "Tabacalera A. Fuente" tradition. La Unica is available in 5 sizes in both Natural and Maduro wrappers. Great taste and a smooth smoke. 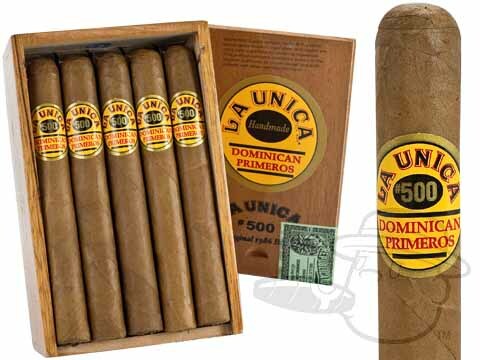 La Unica #500 Natural is rated 3.8 out of 5 based on 2 customer ratings.